Paolo Fanale was born in Palermo in 1982. 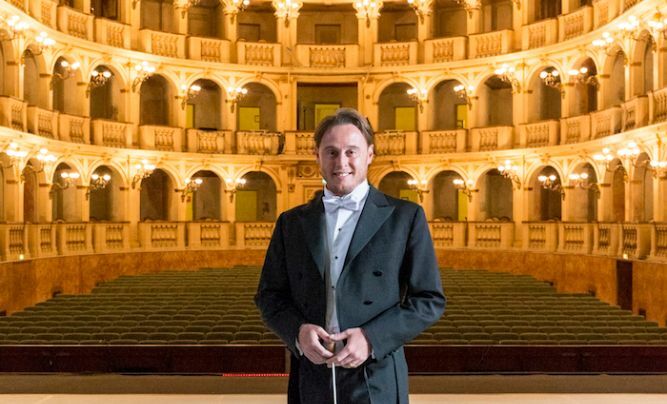 In 2007 he make his pro­fes­sio­nal debut inter­pre­ting Don Otta­vio in Don Gio­vanni in Padua and since then his career takes him on some of the most impor­tant Opera hou­ses all over the world, such as Metro­po­li­tan Opera in New York, Opera de Paris, Baye­ri­sche Staa­tso­per in Munich, Gran Tea­tre del Liceu in Bar­ce­lona, Thea­tre des Champs-Elysees in Paris, Thea­ter an der Wien, New Natio­nal Thea­tre in Tokyo, Den Nor­ske Opera in Oslo, Opera Hel­sinki, Grand Thea­tre in Genève, Palau de les Arts in Valen­cia, Opera de Stra­sbourg, Opera de Mar­seille, Nancy, Tou­lon, Nice, Dublin, Tel Aviv, Tea­tro San Carlo in Naples, Tea­tro Filar­mo­nico in Verona, Tea­tro Regio in Turin, Carlo Felice in Genoa, Tea­tro Comu­nale in Flo­rence, Bolo­gna, Modena, Pia­cenza, Reg­gio Emi­lia, Cata­nia, Ancona, Sas­sari, Rovigo, Trento and Bol­zano. He sings under pre­sti­gious batons, such as James Levine, Clau­dio Abbado, Kurt Masur, Zubin Metha, Daniele Gatti, Rafael Fru­beck de Bur­gos, Daniel Oren and Jordi Savall. Among his recent and future enga­ge­ments: Fal­staff in Amster­dam and at the Royal Opera House in Lon­don, Les Troyens at Tea­tro alla Scala in Milan Don Gio­vanni at the New Natio­nal Thea­ter in Tokyo, Ber­lioz’ Roméo et Juliette in Paris with M° Daniele Gatti, a Reci­tal in Tokyo, Roméo et Juliette in Mon­te­carlo, L’elisir d’amore in Mar­seille and in Ber­lin, Die Zau­ber­flöte at Tea­tro Mas­simo in Palermo and at Tea­tro Comu­nale in Bolo­gna, Così fan tutte at Baye­ri­sche Staa­tso­per in Munich, a recor­ding of Aida and Magni­fi­cat with M° Pap­pano in Rome, Pel­léas et Méli­sande with Mae­stro Daniele Gatti in Flo­rence, Gianni Schic­chi in Lon­don, Lucio Silla on tour in Europe, Don Gio­vanni at Salz­bur­ger Festspiele, Così fan tutte at the Deu­tsche Oper in Ber­lin, a new pro­duc­tion of Fal­staff, direc­tor David McVi­car, at Wien Staa­tso­per and La Tra­viata at Covent Gar­den in Lon­don.